The Blitzboks still top Pool A, but they have let the back door open for New Zealand who go through as group runners-up. 17'- The TRY is awarded to Vilimoni Koroi! 16'- The Kiwis are over in the corner but the TMO must decide! 14' - TRY to New Zealand as skipper Sione Molia goes over for his second. The CONVERSION is also over and we will have one more play! 12'- CONVERSION slotted by Geduld. 12' - TRY to the Blitzboks as Branco du Preez rounds off next to the posts! What an impact he has made! 11'- Playmaker Branco du Preez is now on for the Blitzboks. 10'- CONVERSION slotted by Geduld. 9'- TRY to the Blitzboks as Werner Kok barges over next to the posts! Poor defence from the Blitzboks has handed New Zealand the advantage. The Kiwis know they have to win this game in order to qualify for the Cup quarter-finals. 9'- CONVERSION slotted by Vilimoni Koroi. 9'- TRY to New Zealand as skipper Sione Molia scores under the posts. It comes two minutes after the half-time siren. 6'- TRY to New Zealand as Andrew Knewstubb scores under the posts. It came after Siviwe Soyizwapi went for an intercept that didn't pay off. He also CONVERTS his own try. 6'- Justin Geduld drops over the tricky CONVERSION attempt! 5'- TRY to the Blitzboks as Rosko Specman breaks through the New Zealand defence! 2'- New Zealand oh-so-close but the Blitzboks defence keeps them out. Kyle Brown with a try-saving tackle in the corner! Before kick-off, New Zealand skipper Sione Langi Joseph Molia hands his counterpart Philip Snyman a Kiwi jersey to commemorate Nelson Mandela's 100th birthday. The Kiwis are under pressure heading into tonight's headline match. They beat Zimbabwe 35-0, but went down 21-17 to Samoa. The Blitzboks beat Zimbabwe 43-0 in their second match to book their spot in the Cup quarter-finals. 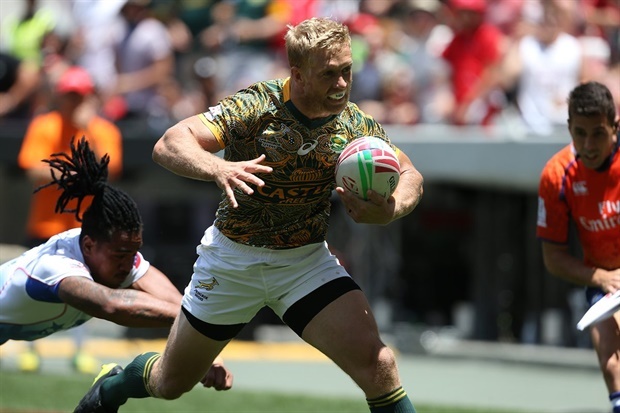 The Blitzboks started their Cape Town Sevens campaign with a 22-12 win over Samoa. LIVE commentary on the Pool A match between the Blitzboks and the All Blacks Sevens from Cape Town Stadium.